IMPORTANT NOTE: Category JB, JC, JE have obstructed view due to solid steel railings or top of lifeboats. 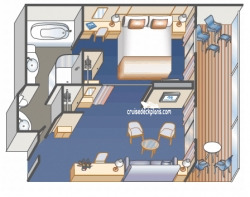 When upper berth is used in cabins that sleep 3, the balcony door will be blocked. 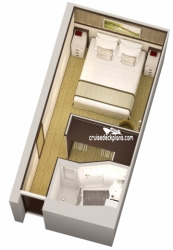 In cabins designed for 4 passengers, the two beds do not convert to queen if upper berths being used. IMPORTANT NOTE: Category IB, IC, IE have obstructed views due to solid steel railings or tops of lifeboats. Category GA upper deck balconies can only be used while in port. When upper berth or sofa bed is used it will block balcony. 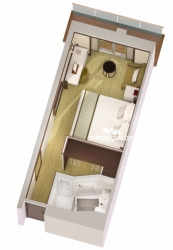 Cabin sizes with balcony ranges from 233 to 291 square feet. Cabin sizes range from 166 to 175 square feet. 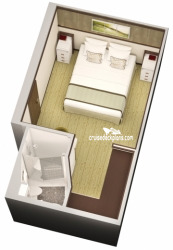 Cabin sizes with balcony ranges from 279 to 335 square feet. 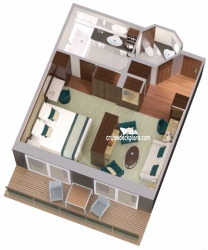 Category B1 and B2 Penthouse suite and is 332 square feet plus 72 square foot balcony. 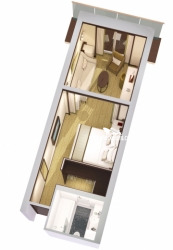 Category B5 Premium suite and is 446 square feet plus 108 square foot balcony. 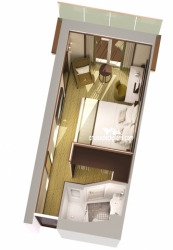 Category B4 Owner Suite cabin is 470 square feet plus the following balcony sizes: A Deck, B Deck, and F Deck is 210 square feet. C Deck and E Deck is 120 square feet. D Deck and G Deck is 190 square feet.